Finding tacos in New York was a major undertaking but finding them here in Texas is a breeze – taco carts are to Texas like bagel carts are to NYC – there’s one on every corner. But finding a “good” one has been a challenge and it wasn’t until I consulted someone who had lived here their entire life was I then introduced to El Ray. El Ray is a Cuban/Mexican Taqueria that’s actually pretty close to our offices here. 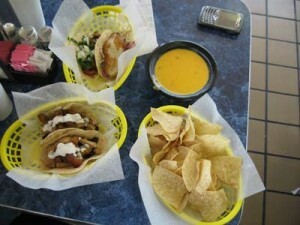 Inside El Ray is nothing special – typical counter/diner set up and come lunch time, it’s always packed. The bar seating along the walls allows more people to cram in – but it’s not uncommon to see a line out the door on any given day. Tacos are reasonably priced in the $1.75 to $2.25 range – but you best bet is to ask for a taco plate for $4.75 – it’ll come with 3 tacos and beans & rice. Anthony came for a visit and we stopped at El Ray for a snack before dinner – I say snack because dinner was about 3 hours away and we were doing a whirlwind tour of Houston. The Cuban tacos are my personal favorite – chicken, black beans & plantains – but those are closely followed by the Ropa Vieja tacos and the Fish Tacos. Try all three if you get the chance – and don’t forget to ask the folks behind the counter for their special hot sauces. They have little dishes of green & red hot sauce that go perfectly with the tacos – not too hot, but they would hurt a beginner. I’ve seen regulars eat entire jars of the red in single sittings – they take this stuff serious here! I’ve also tried the Torta here but it was just so so – I’ve also had friends try the chicken plate, which is enormous, with good feedback. On another note – thanks everyone for the well wishes. Laura & I are going out to California one more time this weekend to be with family and say our goodbyes, and once we return things will settle back into a normal routine and the updates for the HSB will get back into the swing of things. 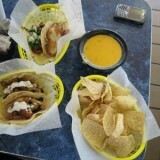 Those tacos were an incredible prelude of things to come for the weekend! LOL, I love the last pic. You are starring at those tacos like they are gold. The one thing I miss about FL is the Cuban food. A mexican/cuban place sounds right up my alley. Enjoy Cali Nick…I just returned from a trip there. Had a blast. Give Laura my best Nick! If either of you need anything you know where to find me! !